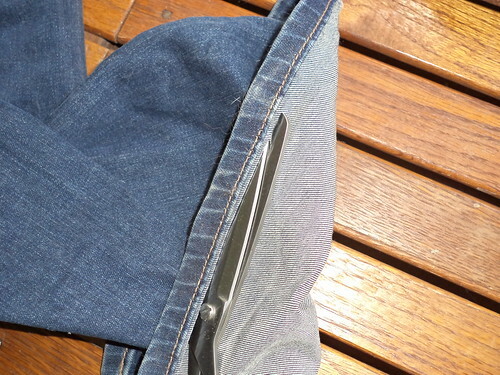 ...the last time I actually had to hem a pair of jeans. I have always liked my jeans long, longer than fashion, usually, but not so long that they are on the ground. Remember the pair that split? I washed them and dumped them in the fabric box. Not exactly sure what I'll use them for but 90% of the denim is still good. You can tell I'm a sewer. "Oh look. There's 5 inches of fabric that I might possibly be able to somehow use." No, you can't look in that closet and count the boxes of fabric. Anyway, I replaced the split pair with a pair from St. John's Bay, a JC Penney brand. I know Penney's has had a lot of problems, but I still love their clothes and check there first when I'm looking for something. I was unprepared for how long this pair was. 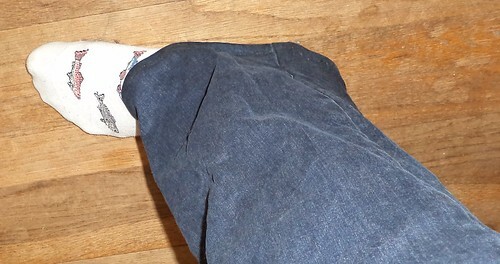 After three washings and drys and they had not shrunk, I realized that, for the first time in, gee, decades, I was going to have to shorten a pair of jeans. It wasn't going to be very much, but I needed to lop off some fabric. My jeans are like a second skin. You have no idea how difficult it was to cut off the hem. I have black jeans which are 12 years old. The president of Levis Jeans has said you don't need to wash them, but I love the feel of freshly washed denim. So, I wash mine depending upon how dirty they got the day of wearing. I don't have a dryer so I hang up my wash. I never wear a pair to work back-to-back, but I will wear one pair for a weekend unless it gets really dirty on Saturday. So, with much trepidation, after putting this pair on, measuring, trying on again and looking, I set the pair on the table, grabbed the scissors and lopped off the current hem. I don't need a lot removed because I love length, but these were just too long. If I order "regular" length, it's not long enough. "Tall" can be an inch or two too long. I folded over the hem one half inch, rolled it again, and pinned. Of course, Mija had to come see what I was doing and to get ears scratched. Once the hem was rolled, I stitched. 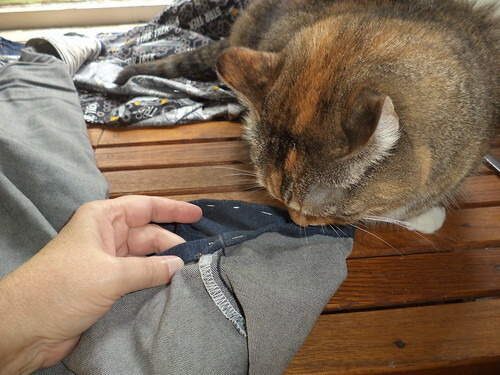 Usually, jeans have the contrasting stitching, but I didn't want to dig through the sewing box and tins for an orange, which his what the topstitching color is. I'm using black that's in the machine for the curtains. It doesn't look like much, but it feels so much better. The heel doesn't drag on the ground now. 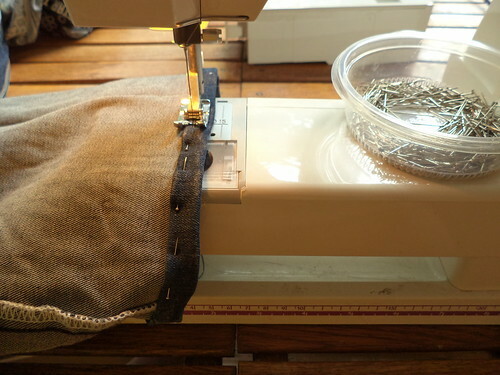 You know, it kind of felt like I was back in college when we spent a lot of time embellishing our jeans, lengthening them with ribbon and seam bindings in a variety of colors or putting embroidery on the legs. Back then, jeans were just another canvas for expression. I like my jeans. This pair fits well and feels good. With just a simple seam, it feels so much nicer.